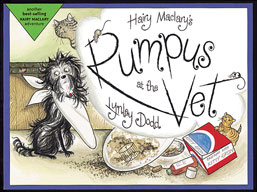 Hairy Maclary is at the vet’s office. The place is full of sick animals of all kinds; there are cats, dogs, a rabbit, some rats, some mice, a goat, and a cockatoo called Cassie. Everything is relatively calm in the waiting room until Cassie decides to tweak an odd furry object which is lying next to her cage. What Cassie does not know is that the furry object is Hairy Maclary’s tail. Cassie pulls on poor Hairy’s tail so hard in fact that Hairy leaps up in fright. And this is what brings about a whole series of disasters for when Hairy jumps up he knocks over the bowl full of mice and a cage full of budgies. The cats in the waiting room then proceed to chase the mice and the birds. Of course all this excitement sets off the dogs who chase each other around knocking things and people down. Children will love the chaos that fills the pages of this charming little picture book. It is amusing to see how one little action on the part of Cassie the cockatoo sets the whole funny situation in motion and we are left wondering what could possibly happen next.